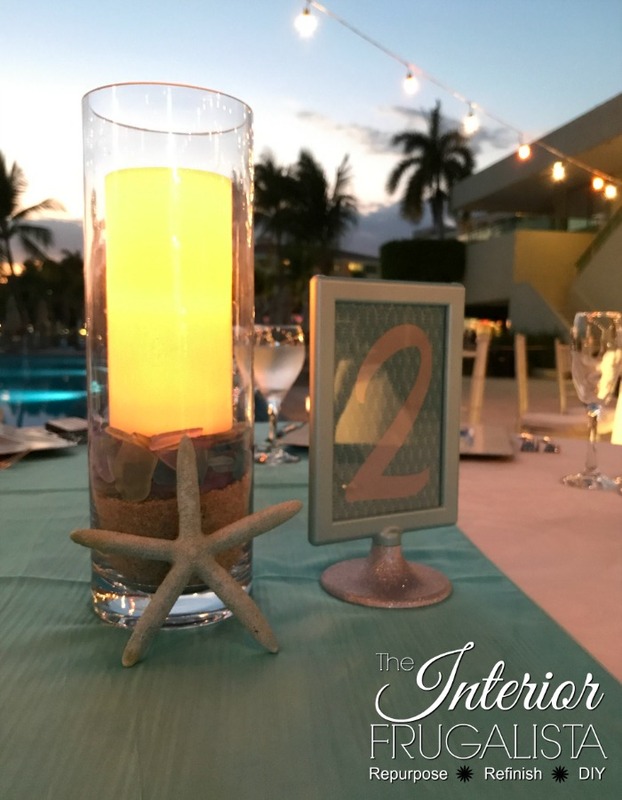 The nice thing about having a destination wedding is that everything is done for you but if you want to add special personal touches, it's much easier on the pocketbook if you make those personalized items yourself and bring them with you. 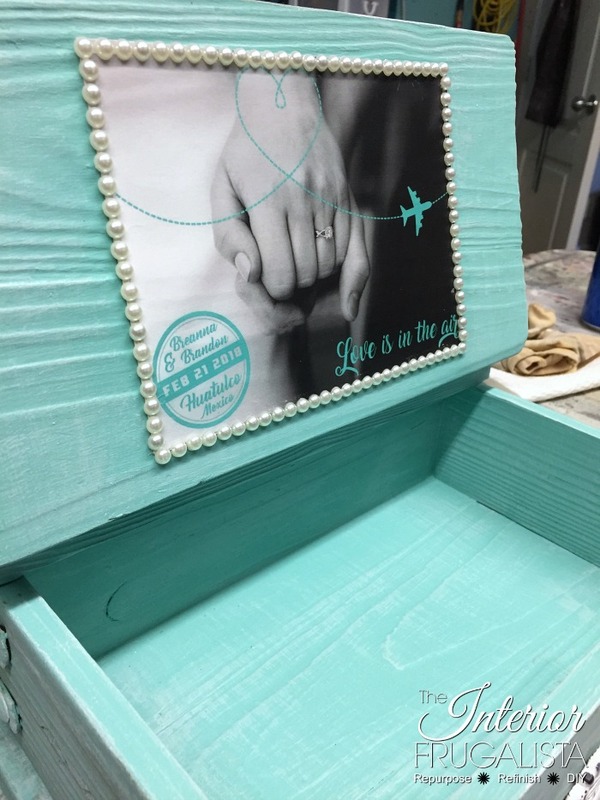 When my soon to be daughter-in-law asked if I'd make a custom wedding card box for their destination wedding, there was no twisting my arm. The stipulations were that it couldn't take up much room in her suitcase and had to be embellished with a beach wedding theme. Tucked in a drawer in the workshop I had this little box. I turned my nose at it a few times thinking it wasn't elegant enough for a wedding. Off to the thrift store to find a more suitable box. After several unsuccessful shopping trips and the wedding quickly approaching, panic set in because I had no clue what I was going to use for a box. ...and the bride and groom both gave me the thumbs up. 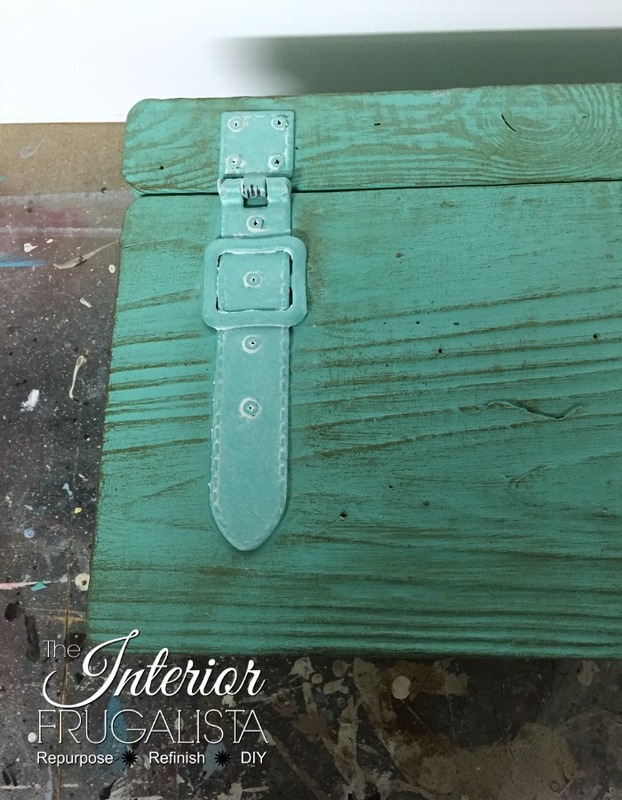 These are the products used to transform the mini treasure chest into an elegant beach destination wedding card box. I've included a materials list towards the bottom of this post. 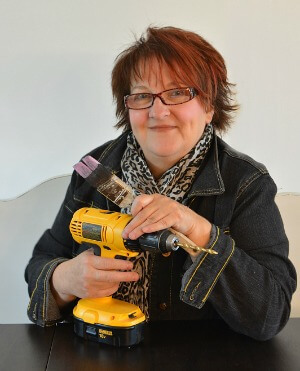 It contains affiliate links for your convenience so you can see what products I used or recommend to make this project. What that means is that if you click on one of the product links and make a purchase, I may receive a small portion of any sales at no additional cost to you, which supports the costs of running this site. See my disclosure policy. 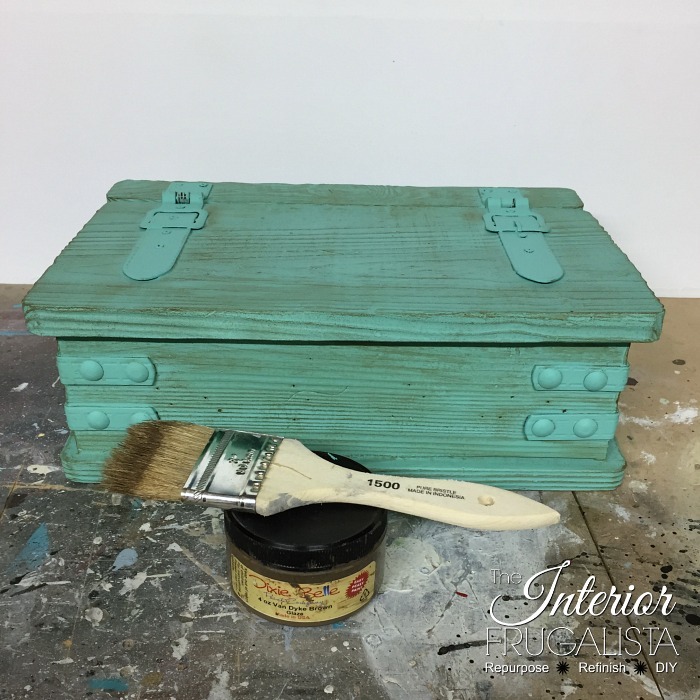 After thoroughly cleaning the thrift store box, it was painted inside and out in the color The Gulf, a teal that matched the wedding colors. It took two coats to completely cover the ugly orangey color underneath. Now it was time to add the beach by aging the box with Van Dyke Brown Glaze, on the outside only. 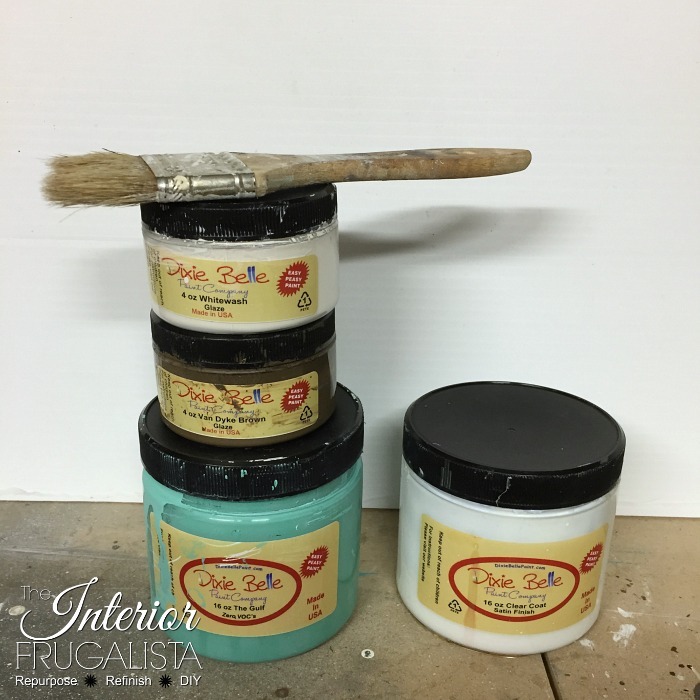 I simply dipped just the tips of an inexpensive chip brush into the glaze and with little pressure on the brush, swiped across the surfaces with the grain of the wood. I removed the brown glaze from the metal cornices and straps before it dried with a damp cloth. While it definitely was starting to look beachy, it certainly wasn't looking elegant for a wedding and needed some white. I added Whitewash glaze to the metal straps, letting it rest in the faux stitches and around the buckle. It definitely helped but the box was begging for more white so I went all crazy with the glaze both inside and out and was thrilled with the results. 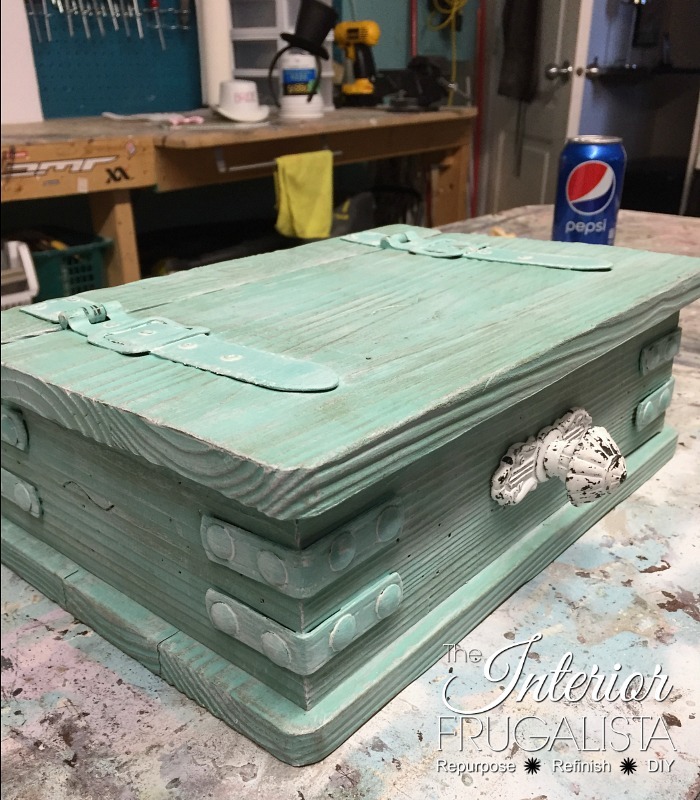 While the glaze definitely added the wedding white it also gave the box more beach vibe. To add some pretty and dress up the front of the box I attached a white cabinet knob with a backplate that I purchased at Hobby Lobby a few years ago. Being a Canuck, that was a real treat and you can read about it here in my post, Canadian Girl's Maiden Voyage To Hobby Lobby. Now for adding a personal touch to the wedding card box. I purchased a ready-made wooden heart to add to the top of the lid but it didn't look right all said and done because it was too thick. That heart didn't go to waste and was used at the wedding and you'll see it in the wedding photos later in this post. In the meantime, I needed a much thinner heart for the top of the box so I did what any DIYer would do, I made one. I traced the shape of the original heart intended for this box onto a piece of high-density hardboard leftover from another project. 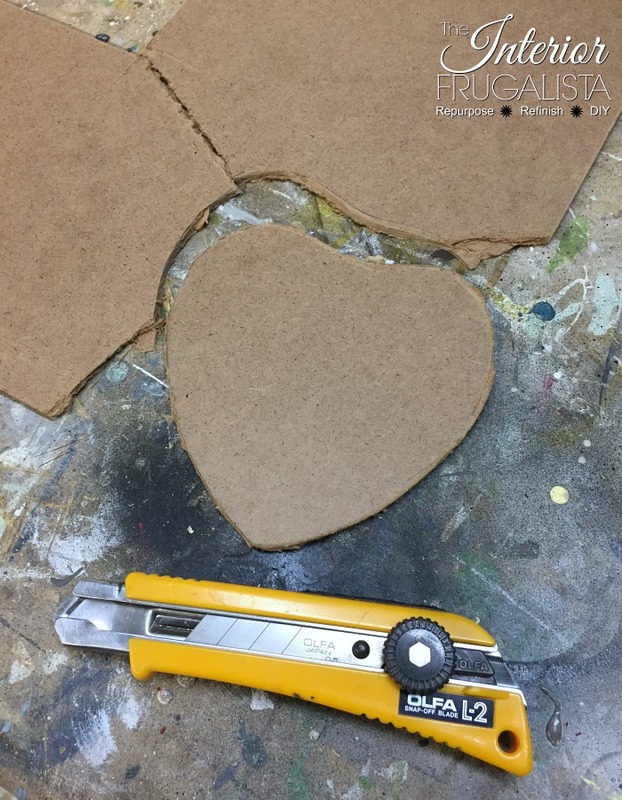 I cut the heart using a retractable knife and sanded the edges smooth with sandpaper. Next, I painted the heart white with chalk paint that I had on hand. In Microsoft Word, I used the same font that was on the wedding invitations and created a graphic with their names and wedding date, sized to fit the heart. 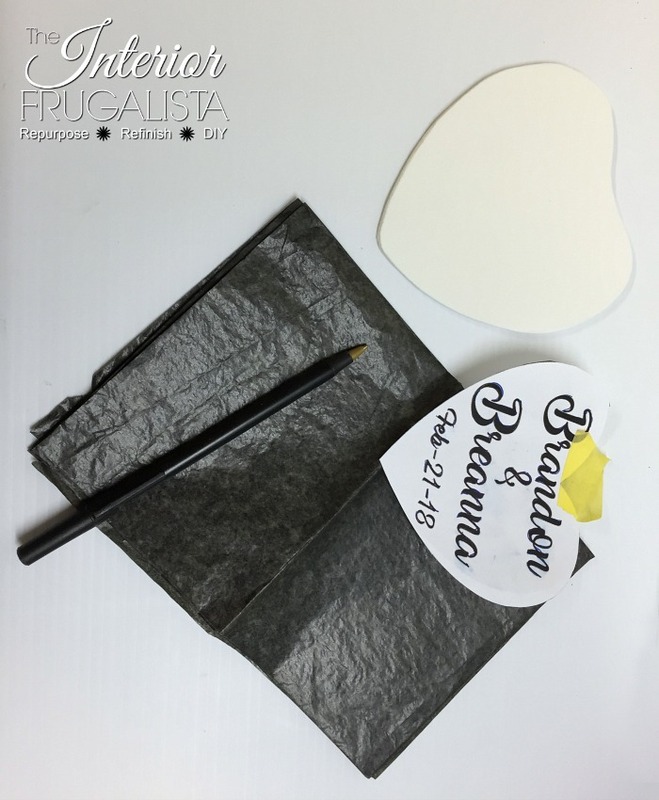 After printing the graphic, I used graphite paper and a pen to trace it onto the painted heart. With a script liner artist brush and black chalk paint that I had on hand, I simply painted over the graphic. Once the paint dried, I glued the heart to the center of the lid with liquid nails glue. The heart added more wedding white to the box but the elegance came from embellishing it with pearl beads. They are self-adhesive pearl bead strand stickers and I reinforced them with dabs of hot glue. You may have noticed the metal cornices are looking much whiter in this photo and you would be correct. 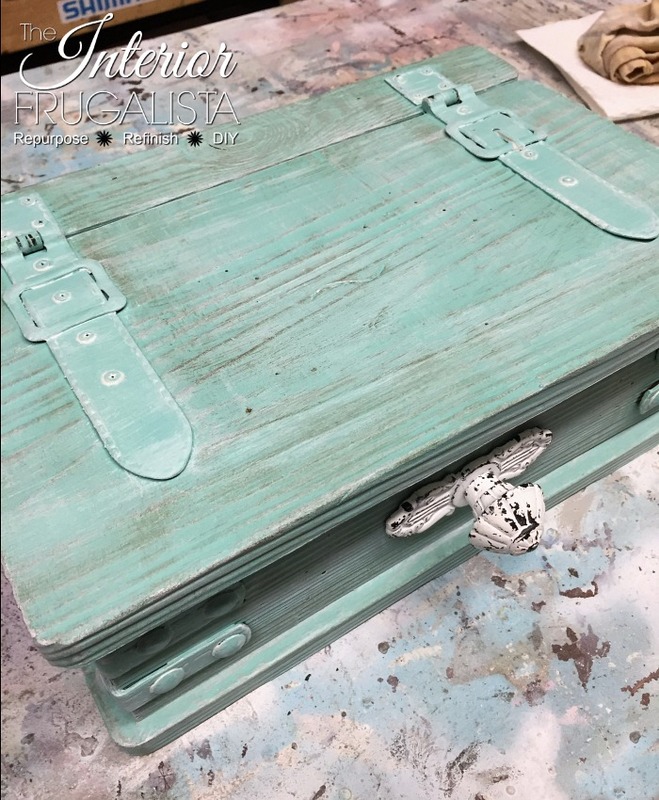 After adding the pure white heart it just felt like the box needed more white and so I added the same white chalk paint color as the box over the whitewash glaze. 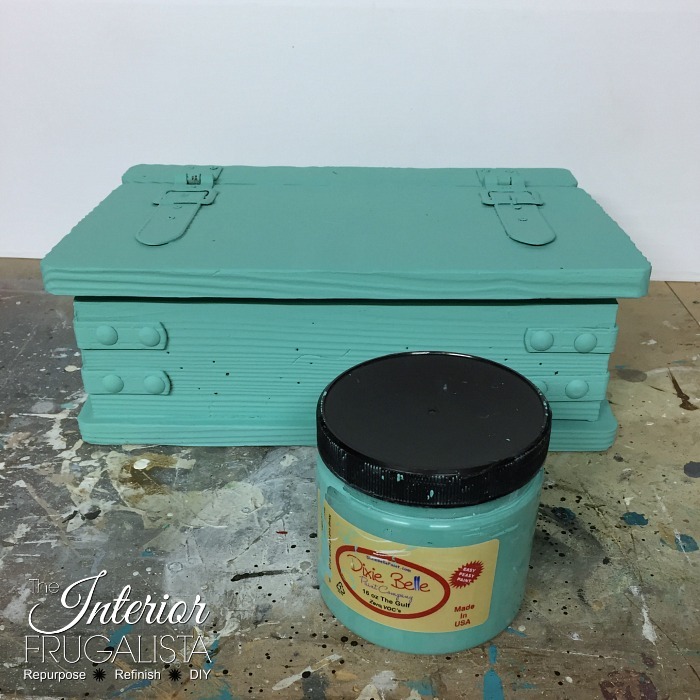 I mentioned earlier in the post that the interior of the box was also painted green but it was layered with only the whitewash glaze. 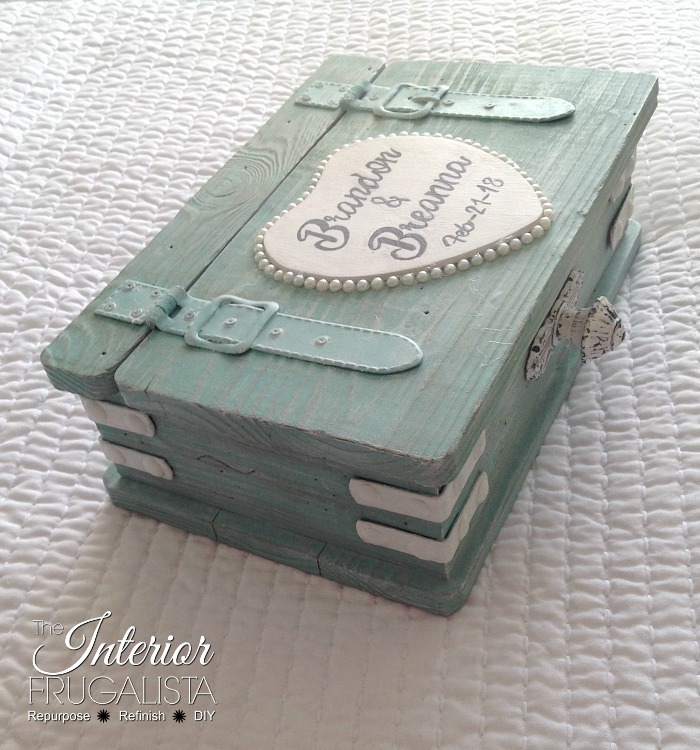 For that element of surprise when opening the box, I decoupaged their wedding invitation onto the inside of the lid. The invitation was decoupaged with Mod Podge and protected with two coats of Dixie Belle Clear Coat. Like the heart on the exterior, the invitation was embellished with the same pearl bead stickers. See the heart leaning up against the box? That was the original heart I was going to use on the top of the box and was so happy to see it being used on the guest table. The little banner behind the wedding card box was made with painted dowels glued inside the stem of chrome furniture knobs. The flags were made with scrapbook paper in the wedding colors and blingy self-adhesive letters glued to a strand of pearlized jewelry cording. Easy peasy! 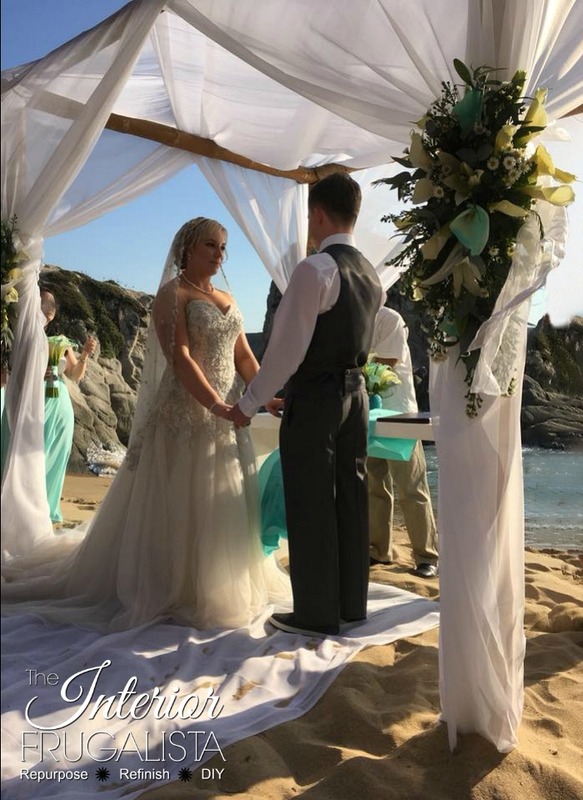 Do you know anyone planning a beach wedding? 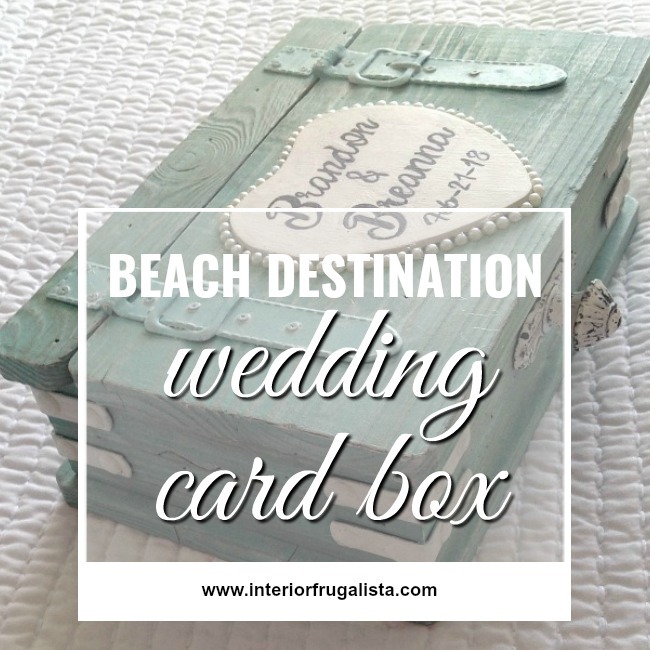 If you do, please share my beach destination Wedding Card Box tutorial and/or save it on Pinterest. 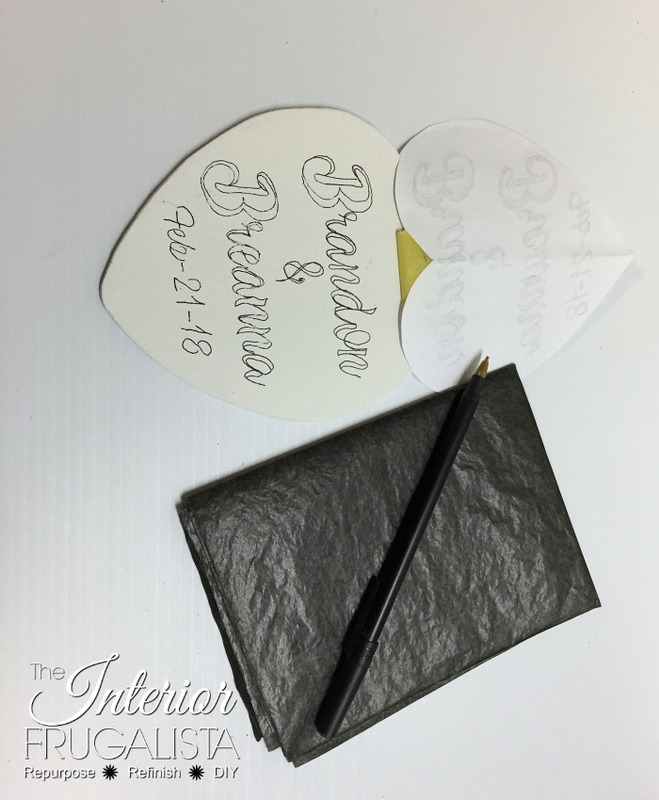 As promised, here is the Materials List so you can see what products I used for the wedding card box. 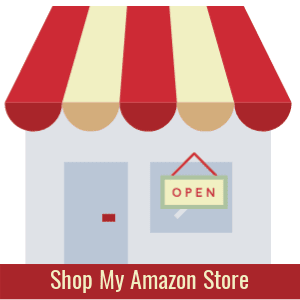 For the products in the list that do not have a link, you can find them in our new Interior Frugalista Amazon Influencer Shop HERE. You've been asking to see wedding photos and so these are the ones I've had permission to share. Being the Mother-of-the-Groom, I wanted to take in every second of our son's wedding and left my phone in my purse. 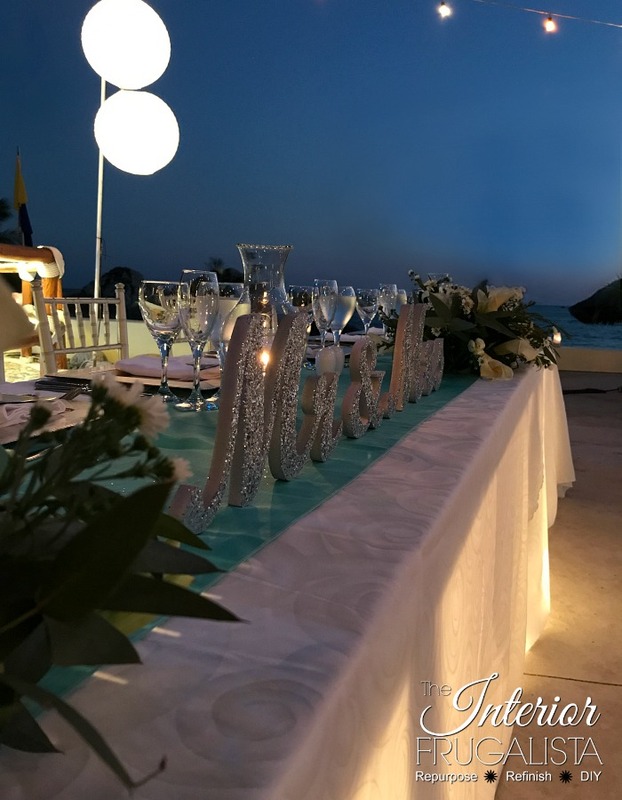 Monica, the wedding coordinator and the staff at Dreams Huatulco Resort in Mexico did an outstanding job! Their attention to detail is impeccable. We were a large group of 30 and the resort staff made us feel so welcome and went above and beyond to make our stay special. 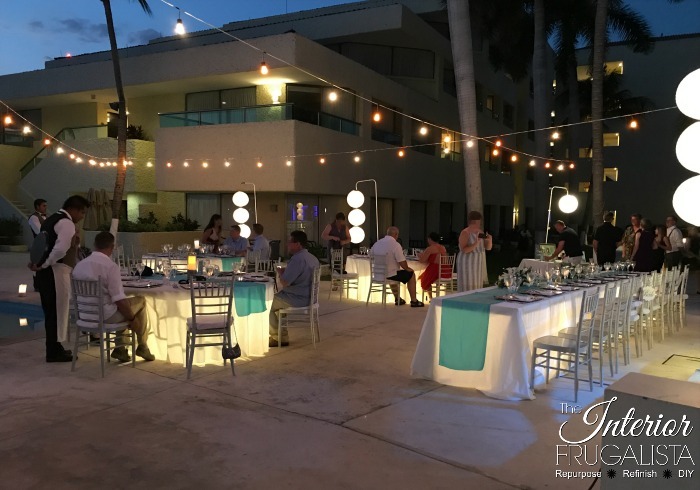 These are the tables at the beach|pool side reception. The illuminated tables, globe strand lights, paper lanterns, and paper bag luminaries surrounding the reception area created such beautiful ambiance. Zooming in closer to the tables, these were the pretty centerpieces. Tall glass vessels filled with sand from the resort, a layer of sea glass, and a candle. 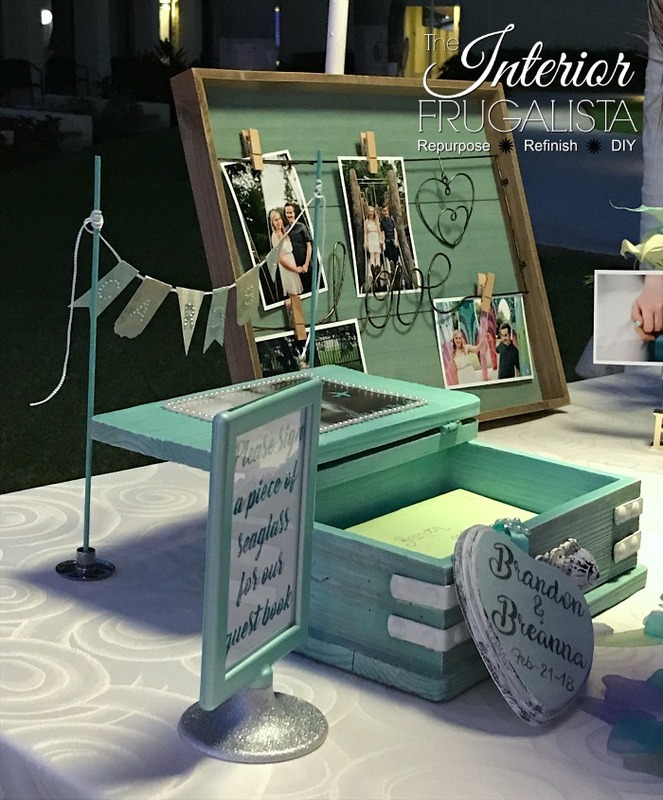 The table markers are IKEA frames spray painted in the wedding colors with scrapbook paper and self-adhesive numbers, made by the bride and groom. You can see the illuminated infinity pool directly behind the reception. There may have been some dancing in the shallow end of said pool. ...were brought over to the head table. This is a photo of the illuminated dance floor with the ocean directly behind. See the blue lights on the rock formation? 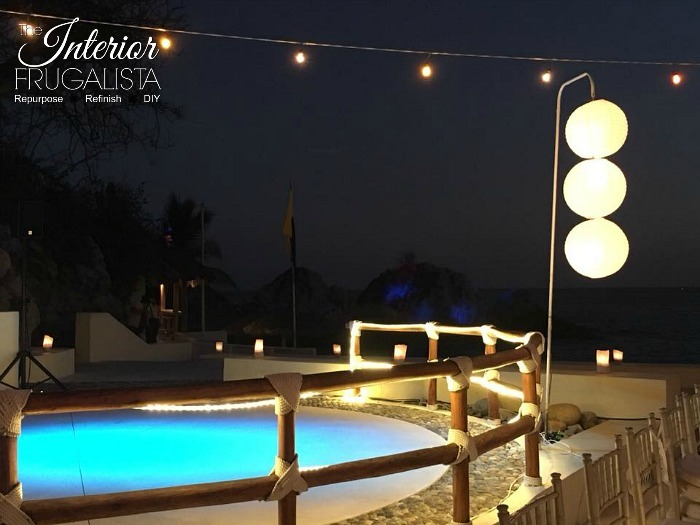 Those are colorful interchanging LED lights that moved 360° around the reception, illuminating various rock formations in the ocean and the walls of the resort. It was absolutely beautiful! 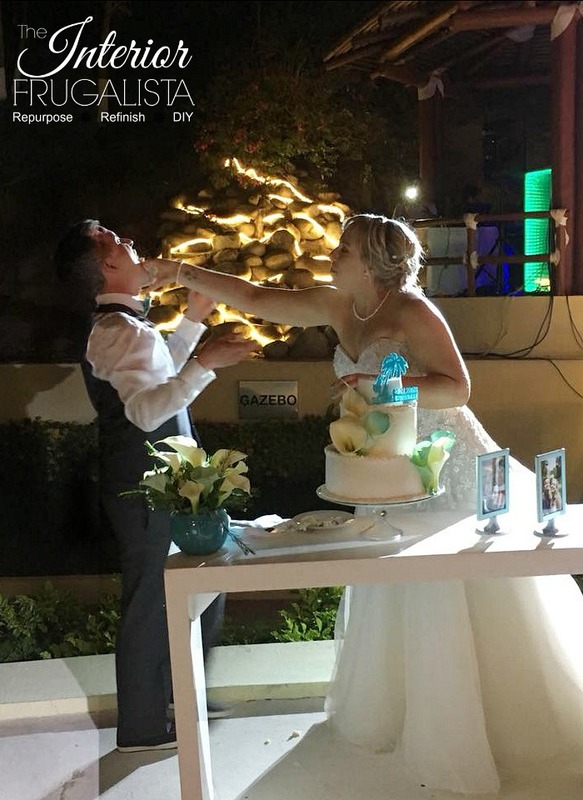 What wedding isn't complete without a cake fight. 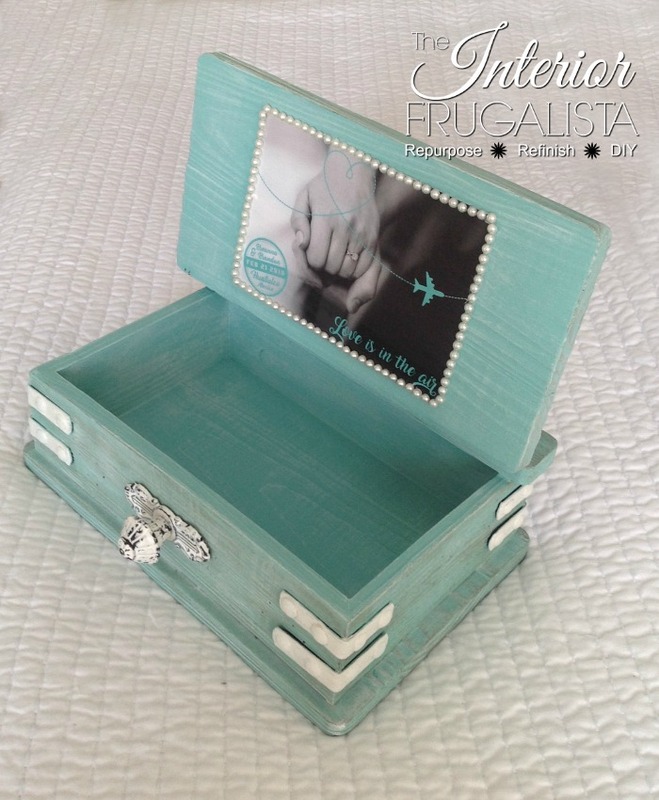 I hope you enjoyed this post and found the wedding card box tutorial inspiring. In case you missed it, I also made a sign for the beach ceremony and you can see it here DIY Beach Wedding Sign. Friends, this wasn't my first DIY Wedding Box rodeo. 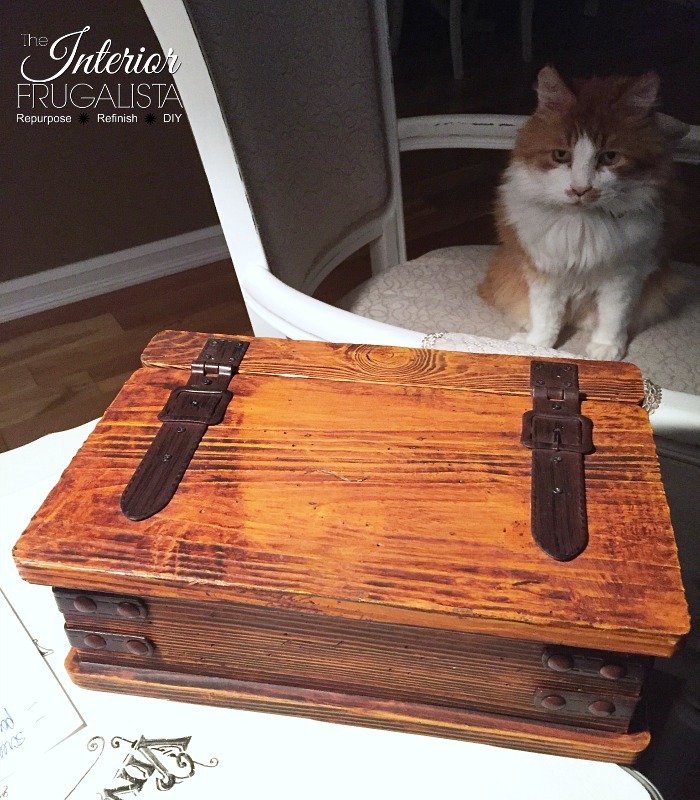 I made this DIY Wedding Card Box for my nephew's wedding and this DIY Rustic Wedding Card Caddy for our daughter's wedding. 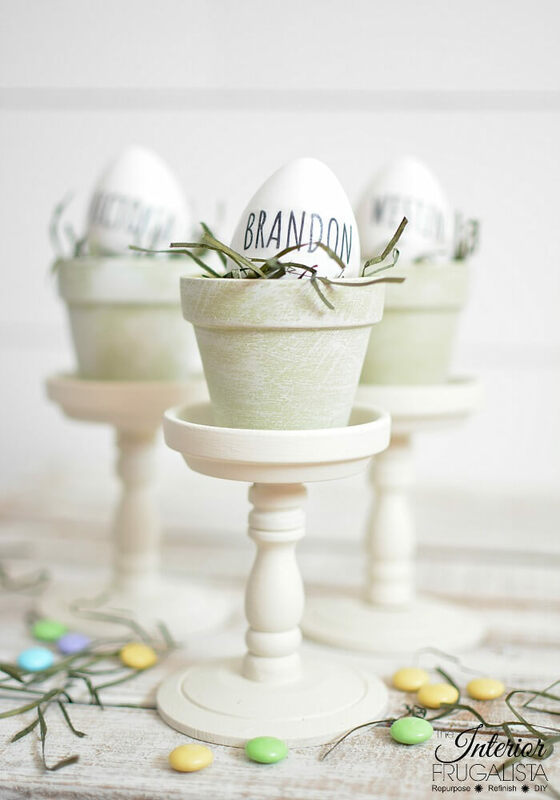 For more DIY wedding inspiration press HERE. This project is shared with these PARTIES.